With silver moonlight glinting on the wave tops below, Guy Gibson leads the first wave of Lancasters low across the North Sea to avoid enemy detection, on the night of 16/17 May 1943. In formation with ‘Mick’ Martin on his port side and ‘Hoppy’ Hopgood to starboard, Gibson heads towards the Dutch Coast and the Ruhr valley beyond. 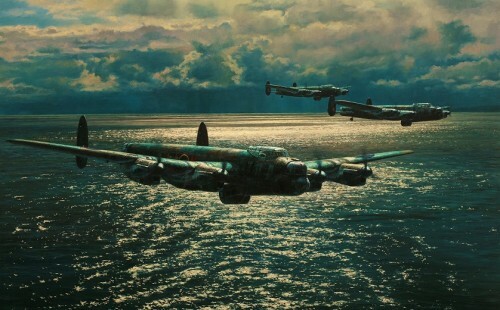 With silver moonlight glinting on the wave tops below, Guy Gibson leads the first wave of Lancasters low across the North Sea to avoid enemy detection, on the night of 16/17 May 1943. In formation with ‘Mick’ Martin on his port side and ‘Hoppy’ Hopgood to starboard, Gibson heads towards the Dutch Coast and the Ruhr valley beyond – their mission, the destruction of the Mőhne and Eder Dams. Guy Gibson, the highly decorated Wing Commander with 173 operations behind him was due to be rested when the unexpected call to see Air Vice-Marshal the Hon.Ralph Cochrane, AOC of No.5 Group had come. The words to the young Wing Commander were simple enough. “I can’t tell you the target” he continued “but you’ve got to fly low-level, on the deck, and at night. As far as aircrews are concerned, I want the best – you choose them. And by the way… I want to see your aircraft flying in four days”. Within an hour he’d selected the aircrew; the very best in Bomber Command. Exactly four days later Squadron ‘X’ – soon to become 617 Squadron – was ready at RAF Scampton. Many familiar faces were there to meet him: amongst the pilots he spotted ‘Hoppy’ Hopgood, Dave Shannon from Australia, together with ‘Dinghy’ Young. The tall, figure of New Zealander Les Munro was there along with David Maltby. The big, beefy American pilot Joe McCarthy and his Bomb-Aimer George ‘Johnny’ Johnson were also called in, as was Australian Mick Martin, the expert in low-level flying. 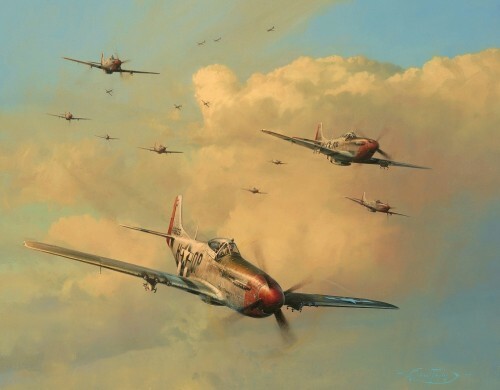 Every one of the nineteen crews who would fly the mission was there and seven weeks of intensive low level flying lay ahead before, on the afternoon of 16 May 1943, Gibson finally revealed the target – that night they were to attack the mighty dams of the Ruhr valley. 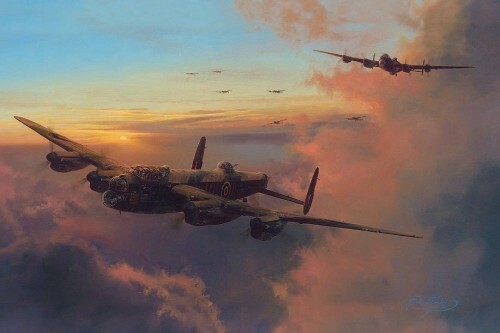 In one of the finest paintings of his career, leading aviation artist Anthony Saunders has completed one of the most compelling Dambuster images of recent years. 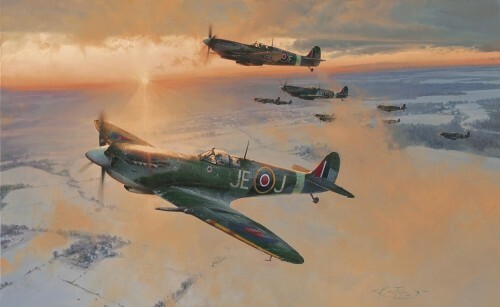 The Military Gallery is honoured that this release, the last in the 70th Anniversary Series, has been signed by veterans who helped to create the Dambusters legend. This fitting tribute to one of the most legendary missions in the history of aerial warfare, creates a historic collectors’ item for aviation art enthusiasts and history buffs alike.